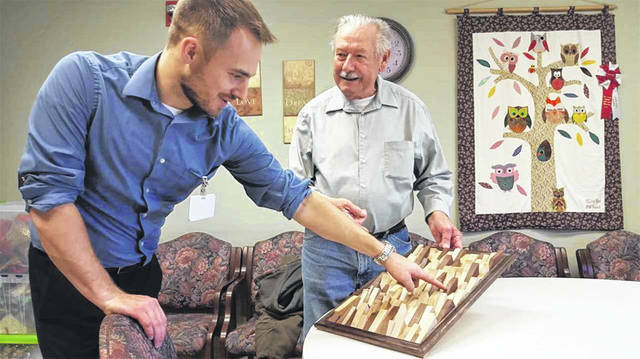 John Apple, right, of Sidney, explains his folk art piece, “Wedges,” to Eric Shoemaker, director of independent living at Ohio Living Dorothy Love, recently. Apple will display “Wedges” and other works in the Hobby and Woodworking Show at Dorothy Love, Wednesday, Jan. 23. SIDNEY — John Apple, of Sidney, is looking forward to exhibiting some of his woodworking creations at the upcoming Ohio Living Dorothy Love Hobby and Woodworking Show. Scheduled for Wednesday, Jan. 23, from 10 a.m. to 3 p.m., in the Amos Community Center at Dorothy Love, 3003 Cisco Road, it is open to community members as well as Dorothy Love residents. Admission is free and community members are also welcome to exhibit their crafts and hobbies. Some exhibitors will have items for sale. “Hobbyists, collectors and woodworkers are encouraged to sign up for a free table to display their talents throughout the day,” said Dorothy Love Activities Coordinator Lori Puterbaugh. To arrange to exhibit, call her at 497-5116. Apple, a native of Farmersville who, with his wife, Donnetta, moved to Dorothy Love five years ago from Middletown, will also show his collection of early antique glass. Constructing a display case for the glass was one of his first woodworking projects in Sidney. It’s a hobby he had not tried before his move to Dorothy Love. “I visited 26 retirement villages before we came here,” he said. Some of the others had woodshops. He was pleased that Dorothy Love did, too. “I went over and met people who were working there. I started to do small things, piddling, really,” he said. He and two other “regulars,” Paul Cook and Pete Huelsebusch, complete projects for the facility, including repairing broken doors and fixing furniture. They also work on their own projects. In addition to his display case, Apple has completed a bookcase for his wife and several Shaker-style occasional tables. “A lady here is trying to make a game. We’re making wood pieces for the game she wants,” Apple said. In the Hobby and Woodworking Show, he will also exhibit a piece of folk art. “We’ve always been interested in folk art,” Donnetta said, noting that the couple were antiques dealers before they retired. Apple’s framed, three-dimensional piece, which he has titled “Wedges,” features small triangles of maple and walnut, carefully arranged to give the illusion of movement. The Dorothy Love woodworkers sometimes purchase wood for their projects, but just as often they “dumpster dive,” Apple laughed. They salvage wood left over from construction and maintenance sites on the Dorothy Love campus. The folk art piece was Puterbaugh’s idea, Apple said. “(Dorothy Love residents) were on a trip, and we stopped at a restaurant. On the wall was a similar thing. She mentioned that she liked it. I thought, ‘I can make her one of them,’” he said. He takes pleasure in the repair work the shop is asked to do. “When we get a door that’s all busted up from here at Doroth Love, we repair that, we’re helping out. I feel I’m helping in some way,” he said. The three men also help each other. Cook, an experienced woodworker, has taught Apple a lot and assisted in the construction of the display case. The bookcase was a joint project with Huelsebusch. Both Cook and Huelsebusch will exhibit in the Hobby and Woodworking Show. In addition to the wood crafts, the show will feature a number of other handmade items and collections, Puterbaugh said. • Marie Stevens, decorated sweatshirts. • Jeanne Mears, cardinal collection. • Will Prenger, photos of his restoration work on Model A vehicles. • Maynard Francis, stained glass. • Pete Huelsebusch, model trains. • Carol Prenger, quilts and baskets. • Ohio Living Dorothy Love Crafters, iris-folded greeting cards and other award-winning crafts. • Jack Oakley, to be announced. Puterbaugh said that while registering in advance to exhibit is requested so that a sufficient number of tables can be available, hobbyists and crafters don’t have to indicate in advance what they will display. Therefore, the show could include a wide variety of other items. “I ask them to sign up for a table, but I don’t know everything that’s coming,” Puterbaugh said.